Un article vraiment profond et qui reste une référence pour moi concernant la réflexion sous-jacente aux pratiques informatiques concernant l'Architecture. In September of 2004 I attended two events that reflect on each other. One was the Non-Standard Praxis conference held at MIT. The other was a memorial at the University of Pennsylvania for G. Holmes Perkins, my dean when I was an architecture student at Penn from 1959 to 1966. He had died just a couple of weeks short of his 100th birthday. The “Non-Standard” in Non-Standard Praxis refers ambiguously to Nonstandard Analysis in mathematics and to emerging computational approaches in architecture. Some of the phrases in titles of presentations at the conference include: performativity, topologies, virtual standardization, amorphous space, hyperbody research, immaterial limits, affective space, algorithmic flares, the digital surrational, the boundaries of an event-space interation, bi-directional design process, and voxel space. The architecture shown was for the most part either generated with 3D animation software or by computational algorithms. Much of it exists only as images, or it has been CNC milled from foam and coated. Much of the work is what has been categorized as “blob” architecture. As would be expected, when built buildings were presented, they were usually less radical than the unbuilt designs. So yes, there was a lot of impracticality and pretension, and a lot of stuff that is not architecture if you define architecture as something you might be able to build with the technologies available in the foreseeable future. But non-the-less, most of the work was extremely interesting, and suggests we are in a highly innovative period in architecture. The architects and students who presented were imaginative, knowledgeable, and committed to bringing the revolutionary power of the computer into architecture at the most fundamental levels. But I was struck by something that was not addressed at the Non-Standard Praxis conference that was suggested by Dean Perkins’ memorial. 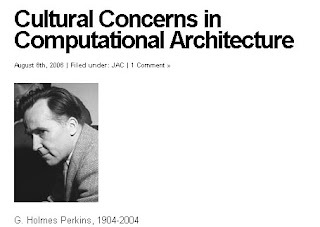 Perkins had been a young modern architect in the 1930s, and had been the chair of city planning at Harvard while Gropius was chair of architecture. In 1951 Perkins was brought to Penn to rebuild the school. He began with the premise that a school of design must include city planning and landscape architecture along with architecture. The landscape and planning departments he built were among the strongest of the 20th century, but the architecture department became even better known as “The Philadelphia School.” Perkins brought to the school Louis Kahn, Robert Venturi, Denise Scott Brown, Robert Geddes, Louis Mumford, Robert Le Ricolais, Edmund Bacon, and many others. In many cases these people were not known when Perkins hired them but developed in the supportive atmosphere he provided. And The Philadelphia School was not just personalities, but a strong curriculum based on a integrated approach to architecture and a unique synergy of culture, school, city, and profession. Perkins had always said that architecture must have an ethical, social and aesthetic component, otherwise it is just fashion. This attitude was lacking at the Non-Standard Praxis conference and among many of today’s computational architects. Perkins was a traditional modernist in all of the best senses. That is the modernism of clarity, social responsibility, a realization that we need to address cities and regional ecology as well as monuments, and that modernism in architecture is a part of a new culture of industrialism and democracy. In short the modernism not only of Mies, Corbu and Gropius, but also of CIAM and Americans like Lewis Mumford and Clarence Stein. Perkins and the Philadelphia School held Mumford’s position that “Architecture, properly understood, is civilization itself.” Perkins and his school based architecture on historical traditions and our current culture and the criticisms of it. Why is this approach absent among many architects today? There is a claim that Modern Architecture failed in its attempt to address social concerns as evinced by the 1975 dynamiting of Pruitt-Igo. But the failure of certain public housing projects is not the failure of Modern Architecture, which was in fact a major success. Modern Architecture was an integral part of the modern culture that brought about a more egalitarian society, a radical increase in lifespan, a diminishment of infant mortality, an education for the average person that exceeds that of Renaissance nobles, and access to the secrets of the atom and the universe. Modern Architecture provided the homes, offices, factories, laboratories, schools, institutions, and cities in which all of this was realized. Over the past two decades many architects, perhaps most notably John Hejduk and Peter Eisenman, have challenged the notion that architecture has social responsibilities. They took this position in response to movements in the 1970s that saw architecture as a branch of social advocacy. But it would be a mistake to think that Eisenman and Hejduk do not have cultural concerns. They both set out to reintroduce Architecture as the central concern of architecture. This is to say aesthetics as a concern with the deepest human meanings. For example, far from being isolated from culture, Eisenman is deeply immersed the postmodern condition, and the various phases of his work are in response to the culture of the time, be it underlying linguistic structures, discordance, or a resolution of chaotic disjuncture. It is this sense of setting in a culture that I found missing at Non-Standard Praxis. We are now in one of the most significant periods of cultural and technological change in history, probably greater in scope than those associated with Newton and Einstein. Developments in quantum mechanics are leading to quantum computers that gain their prodigious power through harnessing their siblings throughout the multiverse. Biotech and genetic engineering are bringing about new species and perhaps the alteration of homo sapiens. Materials engineering and nanotechnology are altering the object we use and how they are made. 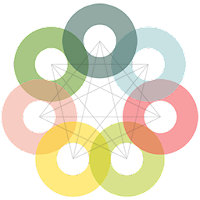 Communications technologies promise that eventually everything can be connected to everything. Cosmologists place us in ever expanding infinities of multiple universes. And individuals will have unprecedented opportunities for education, knowledge and achievement and the prospect of cognitive powers we cannot yet imagine. The ribbed vault was not just a structural technique, but also a means of putting the human soul in touch with God. Perspective was not just a means of organizing pictorial space, but also a means of asserting the human observer. Industrial materials were not just economical, but also a means of finding the human place in a democratic world. In like manner, we should consider Maya, 3D Studio MAX and computational algorithms not just tools in themselves, but as means of engaging our new world. The Non-Standard Praxis conference was based on work exhibited at the Centre Pompidou in 2003 in a show curated by Frederic Migayrou. Brief bio of Dean G. Holmes Perkins.